The Bennets are a family with 5 daughters, living at the family estate Longbourn. With 5 girls, Mrs. Bennet has a considerable amount of anxiety about seeing them all married to a respectable (and hopefully a wealthy) man. When an amiable young man named Mr. Bingley rents the house near them, she has high hopes of marrying one of her daughters off to him. But Mr. Bingley doesn't come to the neighbourhood by himself, he brings with him a friend, Mr. Darcy, who has a less pleasing disposition than his friend does. Elizabeth, the second eldest daughter, clashes with him on more than one occasion and in this lies the true lovestory. I rant about this book every chance I get and since I reread it last week, I thought it would be as good a time as any to do it again. This book has been my favourite since I first read it when I was 14 or 15. And it gets better every time I read it. I love reading new books, but revisiting this one that I already knew I'd love again is so relaxing and I was glad to find that I hadn't prettied it up in my head, it really is THAT good. 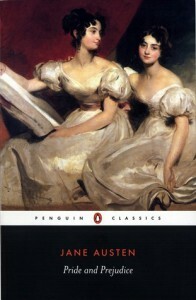 Miss Austen tells the story of a family of 7 with such detail and wit, I really feel I know all of them intimately. And everyone has their own fleshed out character, which I really love. She has a lot of humour and the story flows brilliantly. Sure, I live for the scenes with both Elizabeth and Mr. Darcy, but the rest of the story is beautiful as well. I have talked again and again of how I love Elizabeth, she is an intelligent, strong woman. Mr. Darcy is my ultimate bookcrush, he's so noble and handsome and just dreamy. I also love Mr. Bennet, he's sarcastic and I love his humour. I have always thought that classics such as this and for example Jane Eyre have had so much influence on romance in novels and especially in romantic comedies. A lot of times you can lead the relationship of the characters back to a couple of patterns and I'm always looking for a fresh spin on these in stories. I've seen both the BBC series and the movie adaptation from 2005 and personally, while the BBC version is more true to the book, I enjoy watching the more recent movie more (though of course, the plot is not affected by the changes). I enjoy the whole feeling of it more somehow. My rating: there is no rating for my favourite book ever, the stars are off the chart for this one.